I don't know how far I'll ever go with this blog into full review territory, but I do want to occasionally point out stuff that I think is worth checking out, which is the case with the documentary Dream Deceivers. 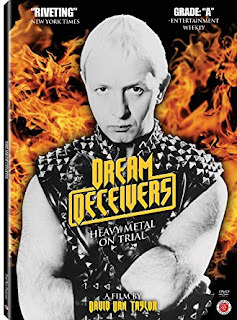 At its most basic, Dream Deceivers is an interesting look at the anti-metal hysteria that gripped an era (and still finds various forms to this day). At its best, though (which is most of the film), it's a moving story that spreads its sympathies around to all parties involved. It's also paced extremely well. There are no terribly shocking scenes (although one could argue that (1) the post-suicide video footage is a bit hard to watch, and (2) the first sight of James Vance's disfigurement may surprise you). By the end, though, there's an almost palpable sense of the delusion holding back the sadness of the young men's families. Dream Deceivers is currently on Hulu Plus and free through Amazon Prime (not sure about Netflix). I'd love to hear your thoughts if you check it out (or have already seen it).